Resources calculations | KORAL s.r.o. The final product of the geological-geophysical survey includes the calculation of mineral reserves. The company Koral Ltd. provides the calculation of reserves based on geological and geophysical documents (drilling, geophysical profiles, spot samples etc.). Incorporation of geophysical measurements in calculations contributes to the accuracy of the calculation. It is possible to use several methods for the calculation. In recent years a calculation using 3D computer simulation belongs to conventional methods of calculation. It is possible to simulate the distribution of certain phenomenon (element) in a given area by using 3D interpolation. 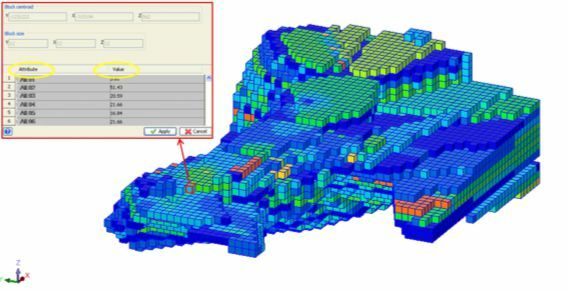 This allows you to create a variety of 3D models that serve as a basis for various calculations. The basic 3D model used for the calculation of reserves is a block model. This model splits the specified area (bearing) into regular blocks. A value that determines the quality or quantity of a phenomenon is allocated to these blocks by using 3D interpolation. The block model as a method useable in the estimation of reserves. Geophysical measurements used in the calculation of reserves (method of cuts).